doing blackwork and watching movies, of course. This weekend I've used the free on demand movies for all they're worth. Hidalgo (okay), You Got Served (horrible--worst dialogue ever), A Guy Thing (amusing enough, and I really like julie stiles), .com for Murder (horrid), Little Women (a classic), Daddy Day Care (very cute), The Big Bounce (classic Owen Wilson--he plays the same character in every movie), Boat Trip, which I'm positive is NOT one of Cuba's sparkliest gems-- it was hilarious for the wrong reasons. I just finished Jersey girl which was a heart felt movie about dad and daughter despite it being hideously ben and j-lo. So, yes, I obviously watched a LOT of movies and so had time for much blackworking. I also ate more than my fair share of chocolate. Good for the soul. Anyway, I've finished both wrist cuffs, and am respectably into the neckline band. The neckline has proven more challenging than expected due to its small size and the bleeding nature of my fabric marker. Its rather imperfect, but still just fine with me. 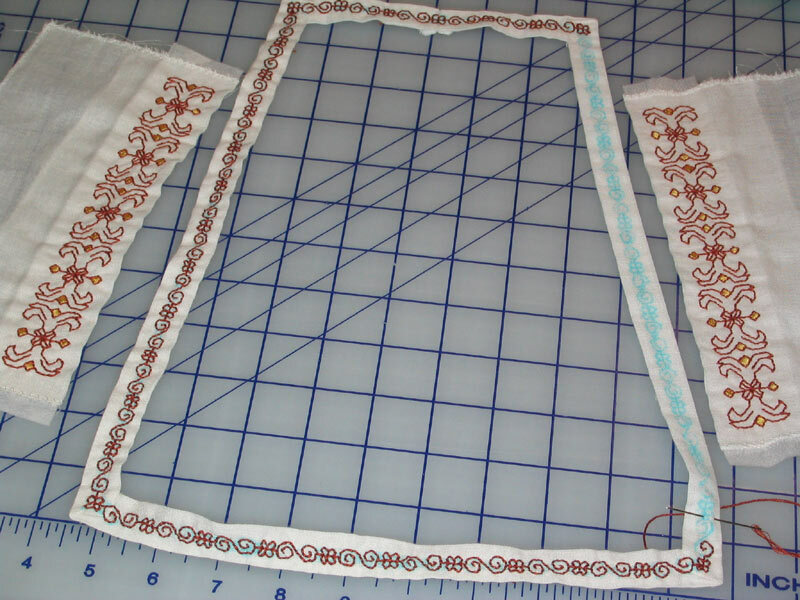 ;-) These will all get straight borders in the rust after they're sewn onto my camica. Hopefully a project I'll delve into this week. Hubby was away, and I had high hopes for finishing a bunch of loose ends this weekend, like finishing some extra cording on the petticoat and perhaps the camica. 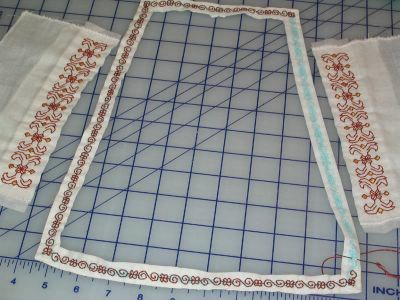 So I figured I should finish the neckline blackwork before I could do the camica, and the whole weekend has been that. Hehe. Its nice to just sit and watch movies. Those other loose ends will wait. I did manage to get out for a while yesterday and do some fabric shopping (yes, again), and FINALLY got the rotary cutter i've been slated for (even gave it its maiden voyage cutting the camica neckline above). I left the fabric store with underskirt material (3 yd remnant for $2/yd) which is blatently shiny and synthetic, and kinda looks like grandma curtains. But the backside has that slubby dull sheen silk look, so I'm going with it. 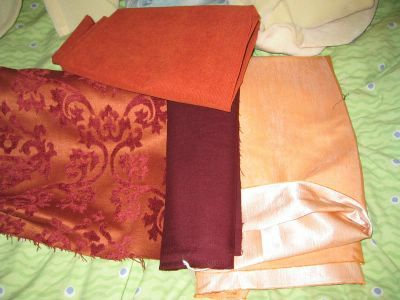 I like the color--its the peach on the right. I also picked up a yard of orange texturey velvet (top) in case I get desperate for extra material for the sleeves--as we know my main dress fabric is limited. If I don't end up needing it, it can live its life as a large tote bag or something.